I have to admit, before listening to Mothers of Invention I suspected it might be a podcast that I’d feel I should listen to, rather than one I’d really want to listen to. It would be, well, Mary Robinson lecturing about climate change. 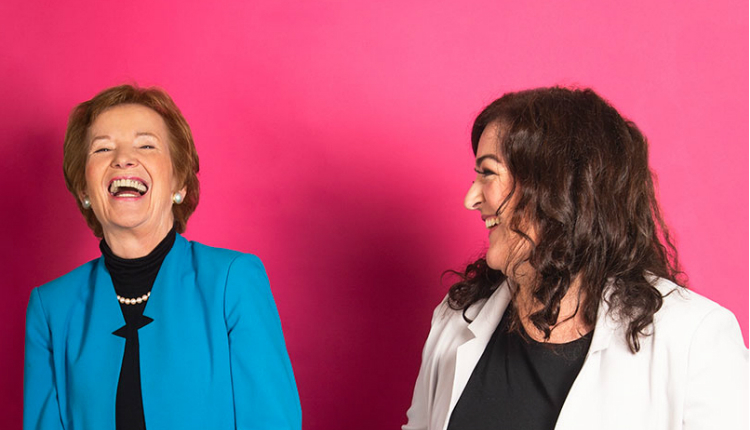 Maeve Higgins and Mary Robinson’s show is excellent: engaging, funny, educational and, in the many stories of the “mothers”, truly inspiring. Climate change is a huge, complex issues which often affects people in ways they cannot readily see. As the podcast addresses, you are not going to change most people’s minds about the subject by appealing to their morality. Rather, you need to spark change by appealing to more tangible aspects of people’s lives: money, jobs, business. In similar fashion, if a podcast of this type is to be truly successful in raising awareness about climate justice, it requires a wide listenership. And for that to happen it needs to be both educational and entertaining, informative but accessible. Mothers of Invention strikes a perfect balance. The success of the show is largely to do with the dynamic between the two hosts and the roles they play, something they acknowledge from the outset. Higgins is a comedian and writer who readily admits she doesn’t really know what the Paris Accord is (like most listeners, you imagine). She is a host who is happy to sum up climate change issues by referencing lines in a Beyoncé song. Then there is Mary Robinson: former president of Ireland and UN High Commissioner, human rights activist and head of a foundation for climate justice. Not, you might imagine, as likely to reference Beyoncé. In the short bonus episodes between the main podcast, we get more of an insight into the relationship between the pair. Robinson is inevitably a mentor and mother figure (Higgins was 8 was Robinson was elected president, she reminds us), but they are also co-hosts, and Higgins is not afraid to gently make fun of Robinson, or lighten the mood when the show needs it. Are feminist men hotter? Did Mary and Nick split the bill on their first date? Robinson isn’t saying. The show itself is summed up in the tagline repeated at the beginning of each episode: climate change is a man-made problem with a feminist solution. Episodes explore different ways of effecting change in the area of climate justice, and talk to a diverse array of women from across the world who are at the forefront of this fight against climate change and injustice. There are stories of people suing their governments, of teenage activism, of climate and mental health, of the materials we are using and how they are destroying our planet. There is a seriously impressive range of guests, from local politicians to presidents and cabinet ministers, local activists to global campaigners, entrepreneurs to world-renowned scientists. This impressive lineup raises another point about Mothers of Invention, something which (alas) is not at all typical for an Irish podcast: it’s a show with some money behind it. Listen to a big-budget American show, like This American Life or Radiolab, and you are not surprised to hear the two dozen or more people credited at the end – producers, executive producers, sound designers, researchers, fact-checkers, and the list goes on. Mothers of Invention is the first Irish-made show I’ve heard with a similar line up. In episode 3, for example, there are twenty-two people credited with working on the show. That’s an incredible number for an Irish podcast, and a sure sign that things are becoming more mainstream when it comes to Irish podcasting in general. Ultimately this is an impeccably produced show with a great line-up of guests whose voices need to be heard. It’s a podcast with ambitions (and listeners, presumably) far beyond Ireland, but given this country’s particularly dismal record on climate change, it is needed here more than ever. Go, listen, and save the planet.